Kejora means “The Morning Star” and can this property can indubitably live up to its name. Facing the stunning Sanur Beach, Villa Kejora has an open-air layout, is spacious and faultlessly pristine. 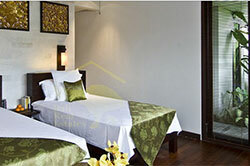 These villas have a simple and stylish interior design with Balinese traditional touches. Furniture is dominated by teak wood and beautiful paintings of Bali island scenes. The tranquil Villa Kejora is located along the coastline in Sunar and ideally faces the cerulean sea and lucid blue sky.